Chandler-Gilbert Community College, in partnership with Intel Corporation will host more than 200 Latina middle school students for the Hermanas: Disena Tu Futuro (Design Your Future) conference on Friday, October 23 from 9:00 a.m. to 3:00 p.m. at the Williams Campus in Mesa. Students from Chandler, Gilbert, Higley, Mesa and Queen Creek school districts will participate in the one-day conference which promotes Science, Technology, Engineering and Math (STEM) to underrepresented Latina middle school students. 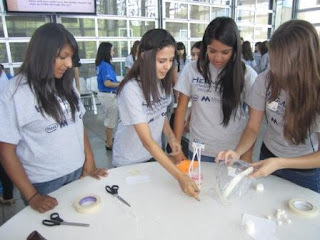 The Hermanas Conference provides a supportive environment in which young women can interact with successful Latinas in STEM careers, explore technological careers, receive encouragement to finish school, attend college and to pursue their goals. "Many young Latinas are not aware of the opportunities available in technology, or what it takes to be an engineer, scientist or a technical professional," said Maria Reyes, Dean Career and Technical Education at CGCC. "All too often, there is the perception that these professions are not considered “traditional careers” for Latinas. The Hermanas conference is aimed to educate young Latinas about careers in STEM, as well as prepare these women to be successful in education and the workforce." The one-day conference introduces students to various engineering disciplines, provides hands-on experiences to build their problems-solving and teaming skills, and includes informational sessions on preparing for academic and professional success in an interactive environment. Participants engage in hands-on engineering design activities coordinated by college faculty, dialogue with Latina engineers in the Latina Town Hall and attend a college fair.